The KE-ARM, s.r.o. company is a leading Czech manufacturer of industrial valves, particularly high quality ball valves and vertical check valves. It has been operating in a market of industrial valves since 1991. The company is a major supplier of both standard valves and valves manufactured according to customer requirements. KE-ARM valves are used especially in harsh industrial environments in the fields of oil & gas industry, power engineering, heat, chemical and petrochemical industries. The main advantage of KE-ARM is a quick and professional response to both standard and special customer requirements. It offers to its customers high added value of its products that is guaranteed by sophisticated technical level based on years of experience in design of industrial valves. Our creative engineering department and well-established manufacturing processes allows us to offer standard featured valves with a possibility for adaptation to a specific process. Our designers are respected for their experience in oil & gas industry, power engineering, heat, chemical and petrochemical industries. A well-coordinated team of the company is ready to offer our customers solutions in short delivery times. vertical lift-type check valves ranging from DN 50 to DN 400, up to PN 400 in the direct implementation, with a branch, and as an automatic recirculation valves. We specialize in all kinds of adaptations of ball valves, for example, double ball valves, heating jackets, lockable handles, underground sets, stem extensions, limit switches, different mounting dimensions and end-to-end lengths, metal seated valves, cryogenic valves, etc. All of offered valves are of our own design and manufacture. The company has its own research and development department, whose staff use modern engineering tools, especially parametric 3D modelling applications, applications for the structural analysis with the finite element method, mathematical calculation programs, and applications for the simulation of fluid flow. All of these applications deliver comfort, accuracy and efficiency in development of our products and considerably contribute to increasing of the quality, reliability, durability and safety. A constant access to the norms and standards relating to industrial valves is a matter of course. The primary goal of the company is a satisfied customer who will receive his goods or services in time and in perfect quality. Therefore the company has been applying a quality management system according to EN ISO 9001 since 2004, which is being regularly tested, thus demonstrating the ability to meet customer requirements and achieve high quality products and services. We provide inspection and identification certificate according to EN 10204 3.1 to all of our products. 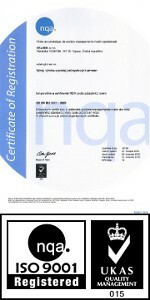 Certificates are available for download in section certificates & documents. Manufacture and assembly of industrial valves are done by experienced staff at our plant in Opava, Czech Republic. Parts of valves are being measured with regularly calibrated gauges to ensure high accuracy of production, all valves are subjected to shell strength tests and tightness tests on a modern test bench with a digital output.